Dr. Savita Rajurkar is an accomplished professional in the fields of Ayurveda, naturopathy and yoga. She holds a doctoral degree in Ayurveda, a master degree in alternative medicines, a post-graduate diploma in naturopathy, and a bachelor degree in Ayurvedic medicine and surgery. She has 25 years of experience in patient care, teaching and mentoring students. Dr. Rajurkar frequently conducts workshops on occupational stress and health management for professionals such as police officers, teachers and corporate executives. She is a renowned teacher on Sanskrit Hindu scriptures such as the Bhagavad Gita. She has received awards for her contributions in drug and alcohol rehabilitation and cancer prevention awareness. As the Ayurveda program lead at NUNM, Dr. Rajurkar oversees the program and curriculum development for the Master of Science in Ayurveda program. 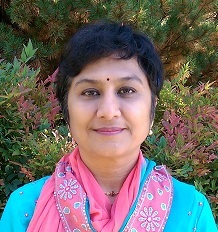 She also teaches elective courses in Ayurveda in the Master of Science in Nutrition program. Holistic health, meditation and Vedic literature are Dr. Rajurkar’s passions. She has authored two books on child health, lifestyle and nutrition. In her spare time, she enjoys culinary arts, singing Indian classical music and painting.